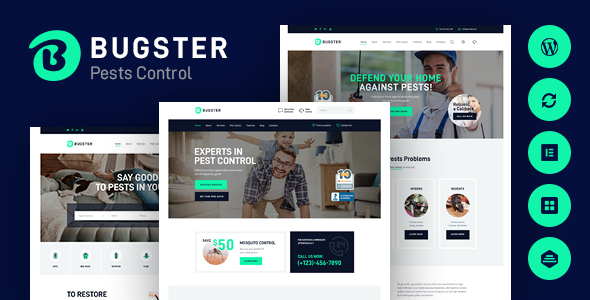 Bugster is a solid and reliable pest control WordPress theme that is a great choice for any kinds of pest services, including pest removal and prevention services, such as bed bugs treatment, pest protection, termite control, mosquito control, wildlife control, moisture control etc. The theme would also be useful, if you provide indoor & outdoor pest control and help get rid of rodents, mosquitos, ants, mice, rats, roaches, spiders, scorpions, silverfish, wasps, centipedes and other pests. Great both for providing residential and commercial services, the theme lets you represent your pest removal services in a most easy-to-understand way, and help you grow your business significantly. Whether you’re dealing with pest extermination, bugs removal, cleaning, or any other pest prevention services, the theme would be a great foundation for your website. Bugster includes such premium plugins as Slider Revolution, Elementor Page Builder, Essential Grid and many other popular ones. The theme also comes with Header & Footer Builder, a flexible tool for creating and customizing header and footer sections for your website. The theme is fully responsive and includes detailed documentation.